I am manifestly on record as mistrusting a) books by women (in my experience they tend to do male characters badly), and b) modern Christian fantasy books (because by and large they are amateurish). 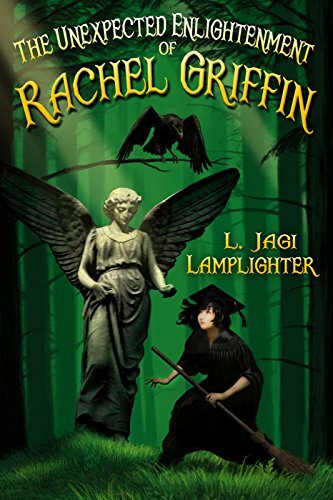 The Unexpected Enlightenment of Rachel Griffin by L. Jagi Lamplighter is both. And I loved it. A kind of cross between Harry Potter and The Chronicles of Narnia (with just a tincture of Jane Austin), The Unexpected Enlightenment takes us to a world where, familiarly, a school of sorcery exists out of sight of the ordinary (here called Unwise) world. But there are differences – one being that, although the culture is recognizably like ours, nobody has ever heard of monotheism. Rachel Griffin is the daughter of an English duke who is an important official in the Magical World. She is sent to Roanoke Academy for the Sorcerous Arts, which exists invisibly on an island in the Hudson River in New York. Rachel is a gifted child, younger than the other freshmen. She has never had serious friends, and dreams of acquiring real ones, like in the books she reads. She also hungers for knowledge – any and all knowledge. One of her gifts is a photographic memory. At Roanoke she does make friends – and some Mean Girl enemies. Her friends include an Australian (!) princess, a boy who slew a dragon and sleeps on a bed of gold, and an aspiring reporter. Rachel’s memory gives her an advantage most magicians lack – when she reviews her memories, she can see invisible things that she missed the first time through. By means of this power, she is able to identify sinister, magical activities, and manages to save a friend from an assassination attempt. Trying to figure out the reason for this crime sets her on an investigation of mysterious currents moving beneath the surface of the school’s day by day activities. Eventually she realizes that something very big and very bad is being planned by someone… even as she falls for a handsome upperclassman… who may be evil. The best fantasy – and this is rare – is both thrilling and moving. I was thrilled and moved by The Unexpected Enlightenment of Rachel Griffin. It exalted me and made me want to cry. I loved it. I’m behind in my reading, but I’m going to go on to the next book in the series as soon as I can. Highly recommended. No real cautions, unless you have strict religious objections to the whole idea of magic. The Christianity of this book is not explicit, but I expect things to become clearer as the story develops. Note: The author, L. Jagi Lamplighter, is a Facebook friend of mine, but I purchased the book on my own initiative. This is a Christian fantasy written by a woman? Clearly you’re going soft. Heh. About that (!) you put up there, are you saying princesses don’t come from Australia, which is true, or are you remarking on something else? By and large, princesses don’t come from Australia, which is part of the British Commonwealth and has a monarch in England.